Kyoto is also called the City of Ten Thousand Shrines, and while the actual number of religious structures is closer to two thousand, it still offers a wide variety of monuments and historic locations to get lost in. The Kiyomizu-dera (清水寺), officially Otowa-san Kiyomizu-dera (音羽山清水寺) is definitely one of them. One of the Historic Monuments of Ancient Kyoto UNESCO World Heritage Site, the Kiyomizu-dera is an independent Buddhist temple in eastern Kyoto. The Kiyomizu-dera, or Pure Water Temple, was founded in 778, few years before the Heian period and thus Heian-kyo (modern day Kyoto) becoming the new capital of Japan, originally affiliated with the Buddhist Hosso sect, taking its name from the waterfall within the complex, running off the nearby hills. The present buildings were built in 1633, by order of the Shogun Tokugawa Iemitsu. Today the Kiyomizy-dera is so much so in the popular folklore of Japan that the expression “To jump off the stage at Kiyomizu” is the Japanese equivalent of English expression “To take the plunge”. A hot spot for both, tourists and Japanese, the Kiyomizu-dera offers a breath taking view of Kyoto and is even open at night (until 21.00 or 21.30) during three periods throughout the year, with a stunning illumination of the temple complex: in March, in August (14 – 16 August every year, for the Thousand Day Visit), and in November. 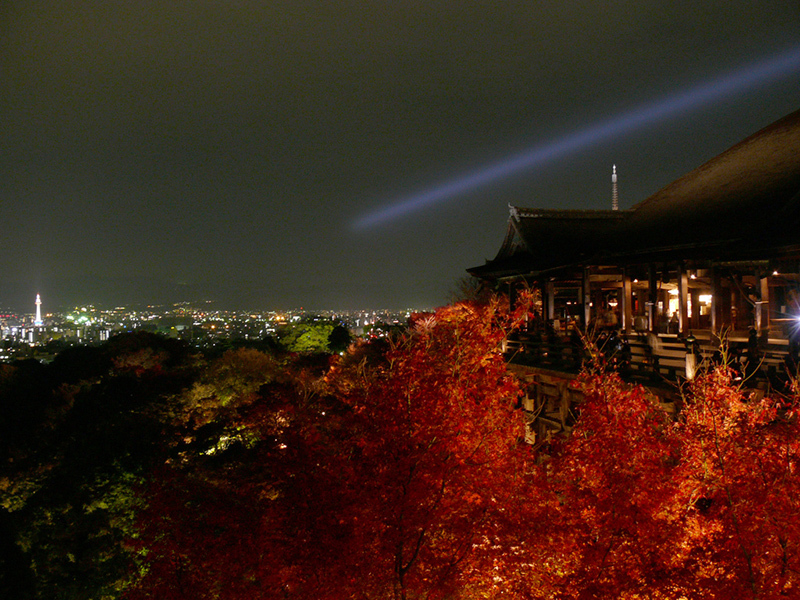 Also the Kiyomizu-dera can be visited on the night of New Year’s Eve, when it is kept open all night. The main stage of the Kiyomizu-dera has a large veranda, supported by tall pillars, Beneath the main hall, is the Otowa waterfall, that gives the temple complex its name. Visitors can drink this water, believed to have wish-granting and purifying qualities. 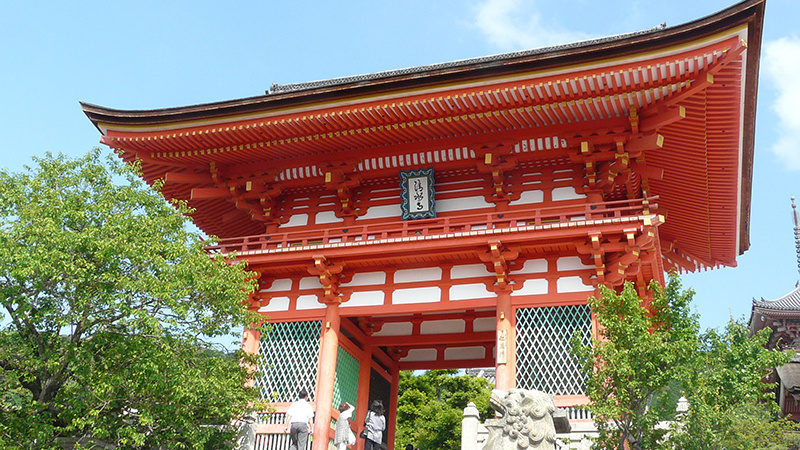 The complex includes the Jishu Shrine, dedicated to Okuninushi, a Shinto deity of love. The shrine houses two “love stones” and visitors can walk from one to the other with eyes closed, if they are able to reach the other stones, it means the pilgrim will be able to find his true love. The Temple of Pure Water is also famous for its Eleven Headed and Thousand Armed Kannon Bodhisattva statue, representing the Bodhisattva of mercy and compassion, the Deva Kings, guarding the entrance to the temple on both sides and the stunning Jojuin garden, also known as the “Moon Garden”, a wonderful Japanese garden, guaranteed to enchant you. A distinguishing characteristic of the Kiyomizu-dera is that the veranda of the Kiyomizu stage, built with 12-meter high keyaki pillars was built without using a single nail. The Kiyomizu-dera also offers several events throughout the year, one of which is the Seiryu-e, a Buddhist event in which several participants, clad in rich, historical costumes, parade through the grounds, and a magnificent Blue Dragon (Seiryu in Japanese), incarnation of the Kannon Bodhisattva, together with the Four Deva Kings, moves through the complex, followed by sixteen deities. The Kiyomizu-dera is a suggestive location that has become representative of Japan’s landmarks as a whole, encompassing many of the folkloristic styles the country is famous for. The many attractions inside the complex are guaranteed to fascinate and surprise you. The soothing tranquility of the temple is bound to provide an enlightenment hard to reach anywhere else. The Temple of Pure Water has shaped Kyoto’s panorama even before it became the Capital of a Thousand Years, and is definitely worth a visit, you won’t be disappointed! opens at 6:00 a.m. but closing time varies depending on the season. For details, please visit the official website. Please refer to the official website for the latest information.